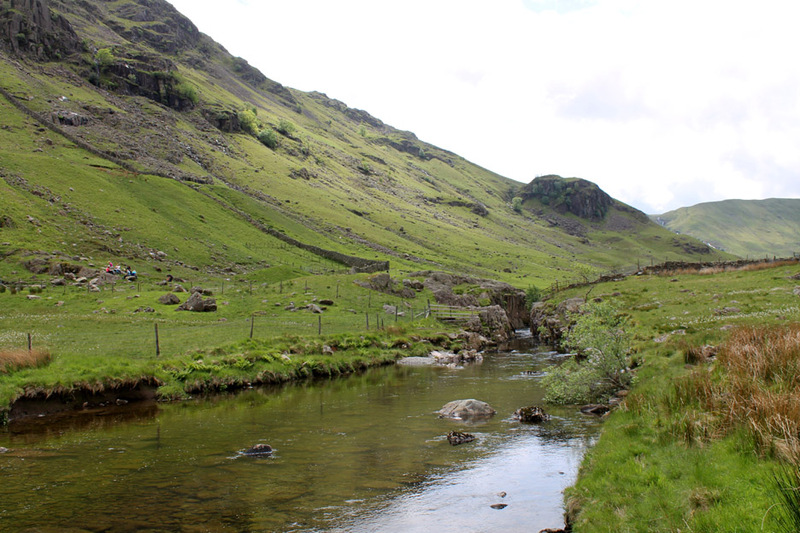 " Langstrath on the level "
Date & start time: Sunday 16th June 2013, 11 am start. 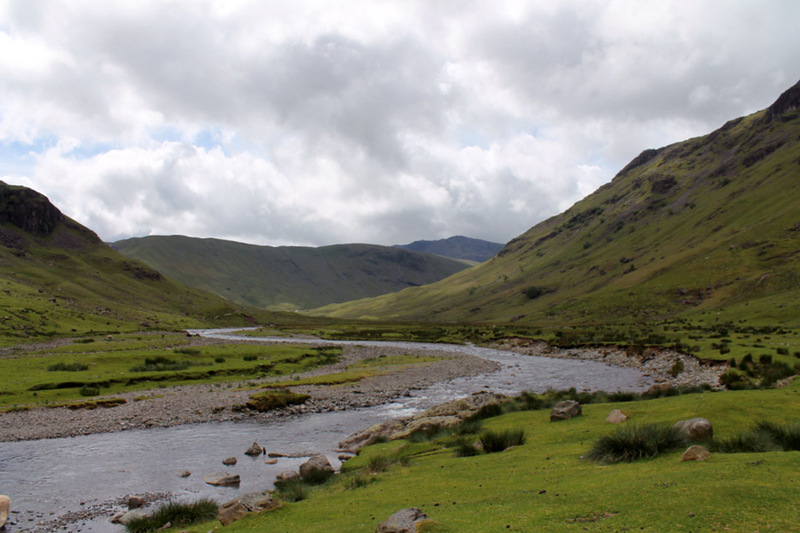 Places visited : Stonethwaite, Langstrath, Black Moss Pot and return. 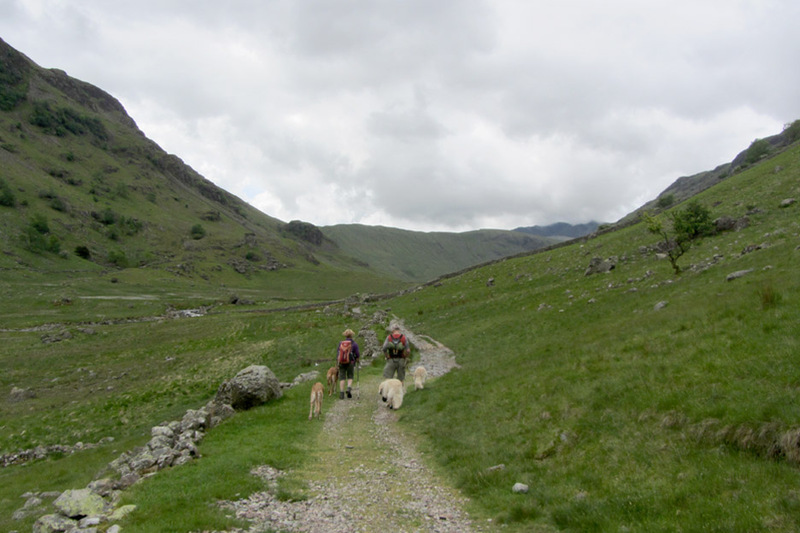 Walk details : 4.4 mls, 450 ft of ascent, 3 hours 40 mins including a liesurely lunch. Highest point : Black Moss Pot 600ft above sea level. Weather : Overcast with sunny periods, gentle but cool breeze at times. the grand old lady of the pack would prefer a less active, less manic walk. 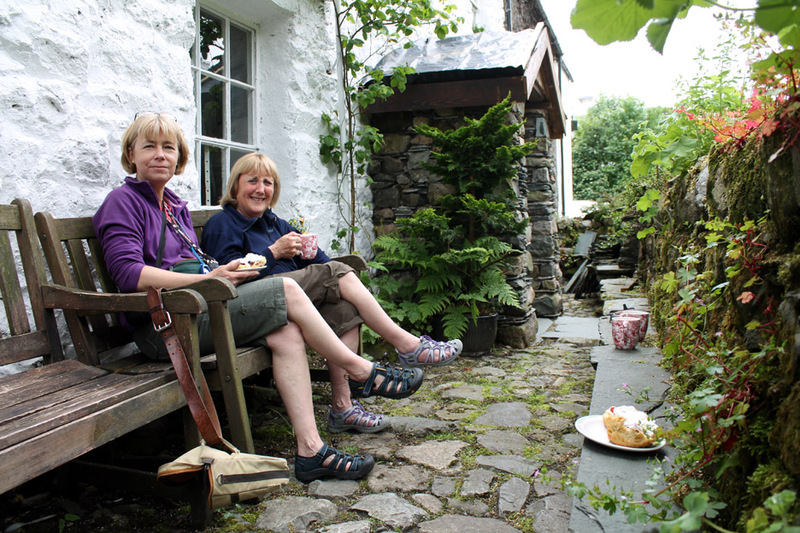 'Needs must' therefore for a flat walk today so when Jo came over we packed the swimming costumes and some lunch and headed for Langstrath. Would the weather stay sunny . . . would the water be warm ? Were we too optimistic . . . is the Pope Catholic ? 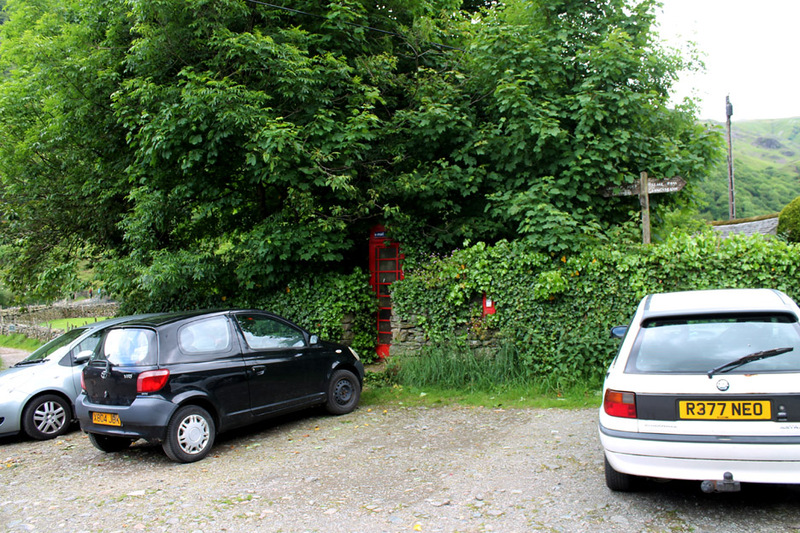 Parking by the red phone box at Stonethwaite . . . if you can work out where it is (a good memory helps). 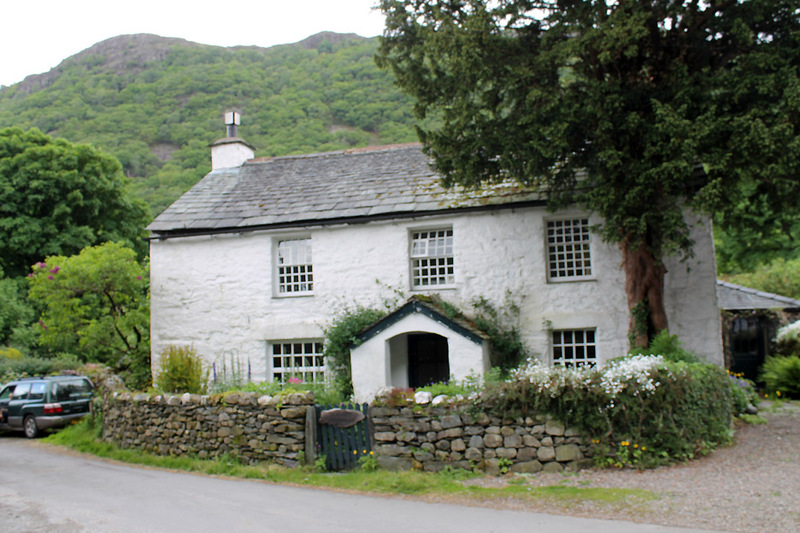 Another Yew Tree Farmhouse, one of many in the Lakes. 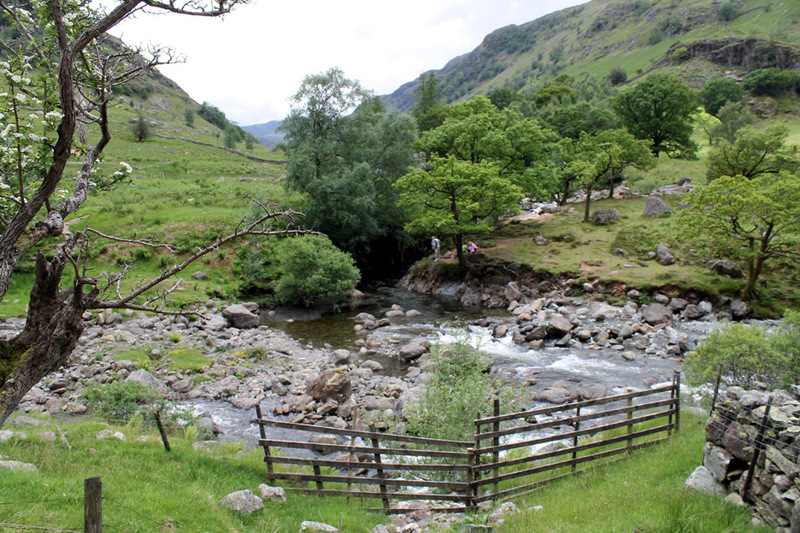 This one is in Stonethwaite at the start of our walk. I think we found the last parking spot as many of the others further back were being used by folk attending the Borrowdale School Summer Fete. 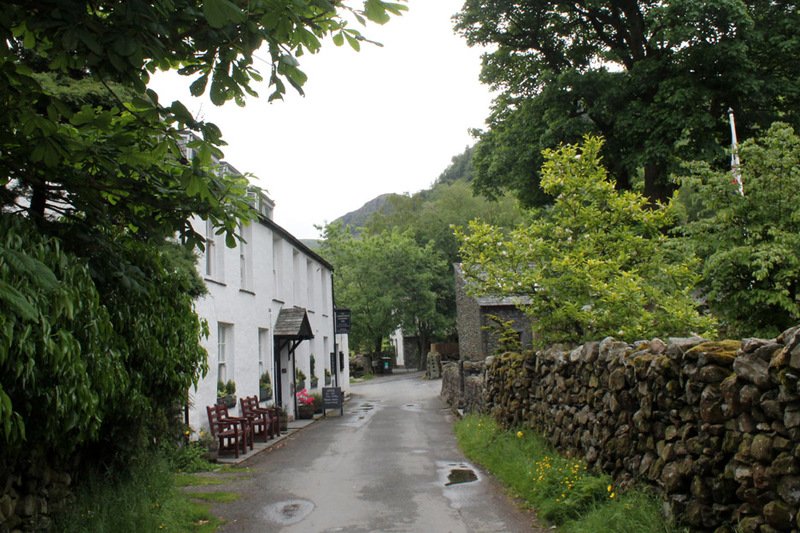 Summer colours and full leaves on the trees as we pass the Langstrath Hotel. 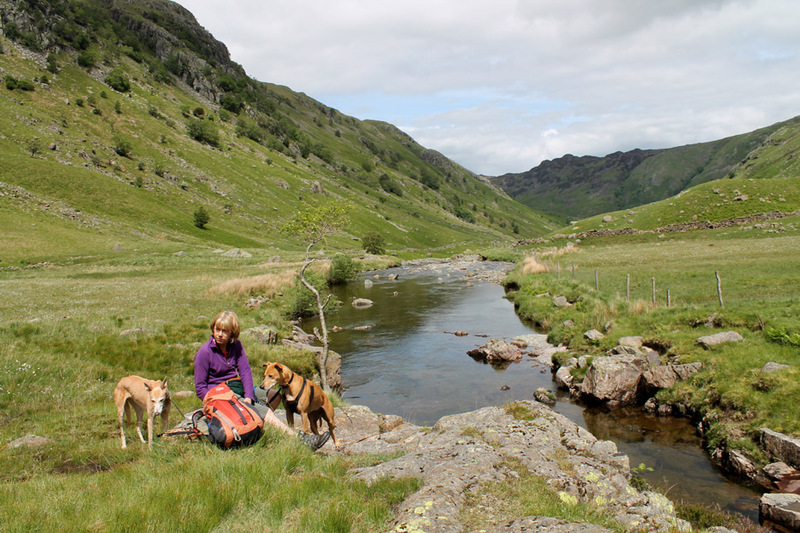 Looking back to sunny Kings How and the Maiden Moor ridge flanking the Borrowdale Valley. Galleny Falls . . . running reasonably full due to some rain in the last 36 hours. 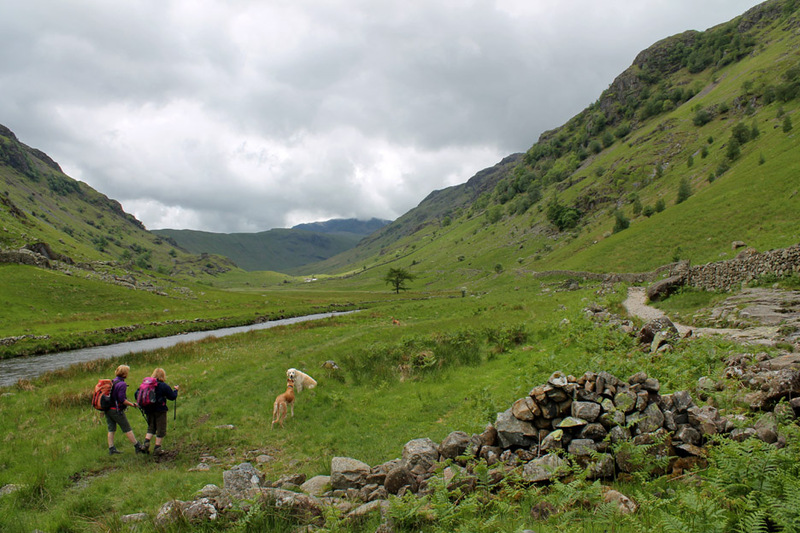 We turn and start our walk up Langstrath Valley. 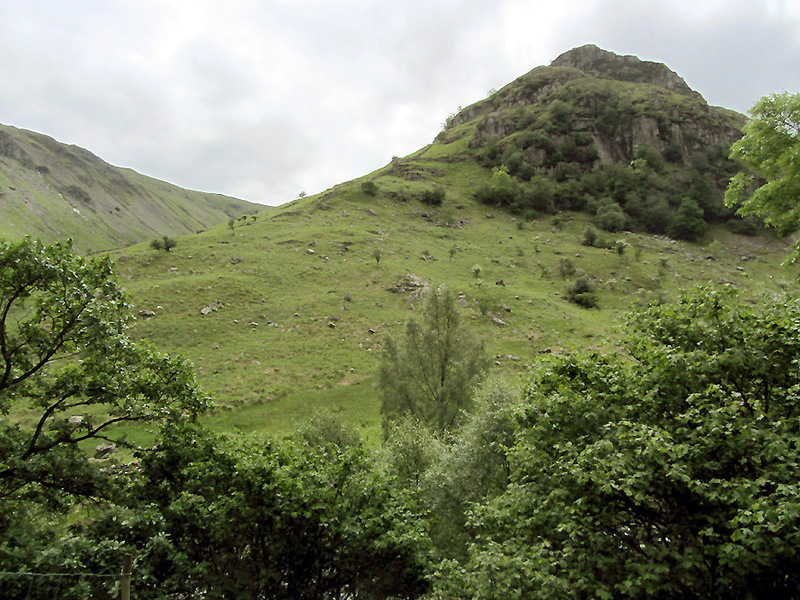 Above us, across the river, is the steep ground of Eagle Crag. The track makes its way up the valley, with the opportunity occasionally to take to the grass, to give a break from the stony surface. Up ahead . 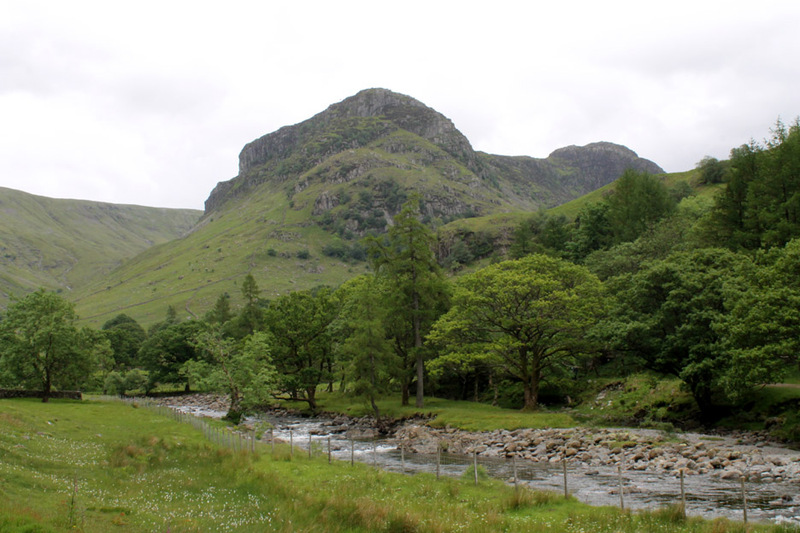 . . still some four miles away is Bowfell, its top just touching the clouds. 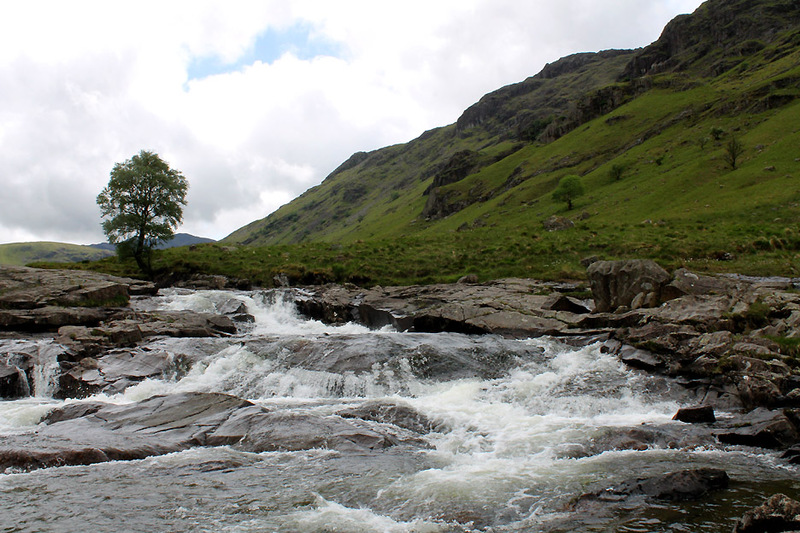 There are a few areas of harder rock that cause the river to alter its characteristic stoney disposition. Here a band of rock causes the water to cascade over a wide open falls, large rocks cluttering the downstream side of the falls. Close-up look at the top section. Looking back from above the falls. 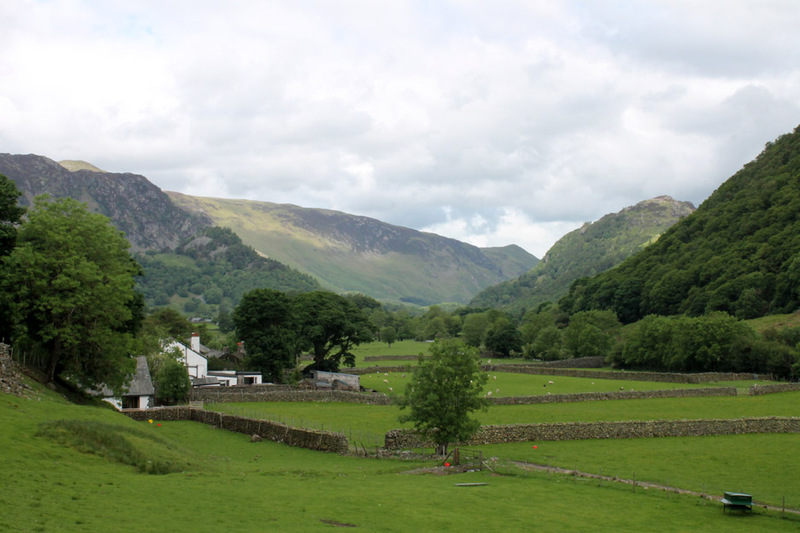 Eagle Crag is now down the valley on the right . . . the orange dot mid picture being Jo's rucksack. 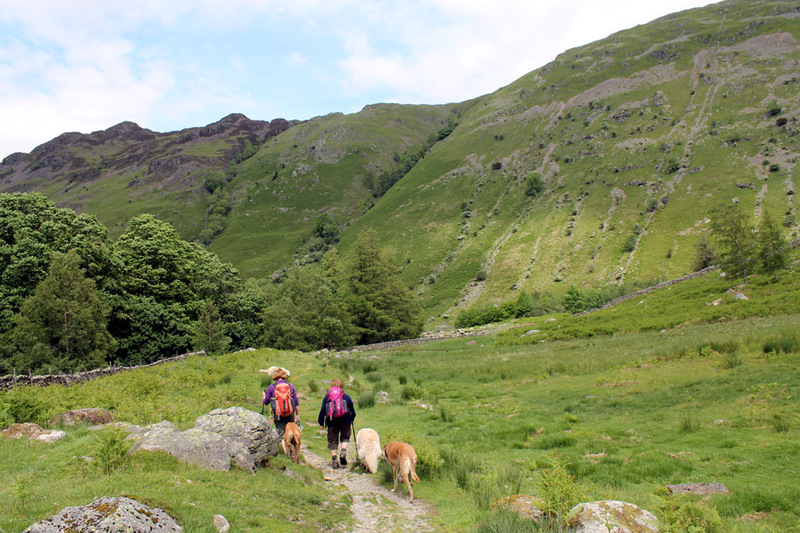 Just one more flatter section of track and we'd be at Black Moss Pot. 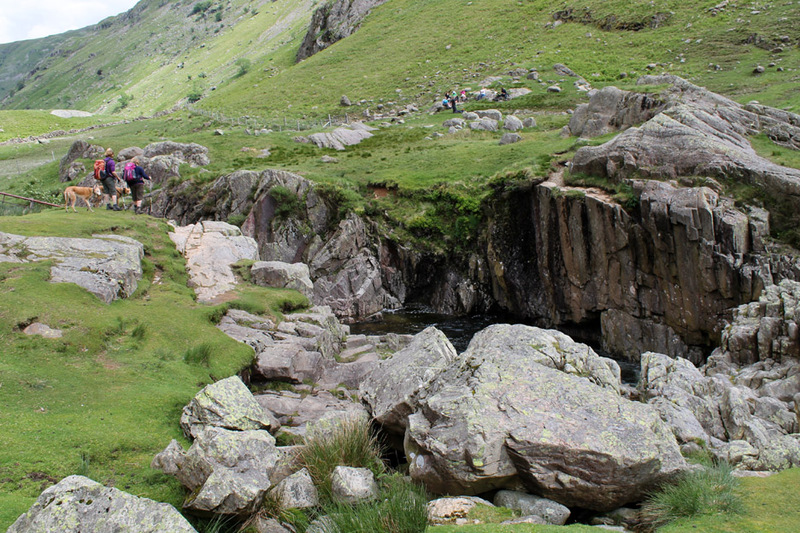 and now forms a delightfully narrow gorge with a waterfall at the top end. The water is beautifully clear . . .
. . . and deep enough for a swim. 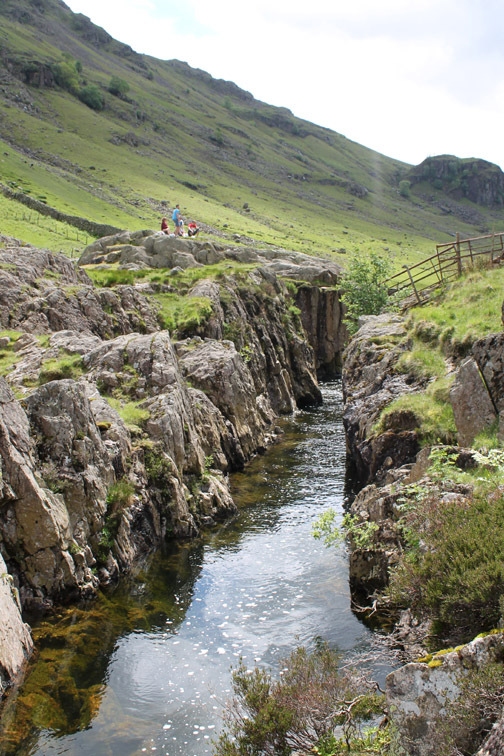 Those of a more macho disposition also jump off the cliffs opposite and drop some 15 to 18 feet into the water.
. . . the valley after all in not called Langstrath (the long valley) for nothing. Ah the sun's come out and we find a dry area for lunch. all led to us losing heart and passing on a swim today . . . favouring a return on a warmer day to this lovely location. so our return trip was a back-track of our outward route. 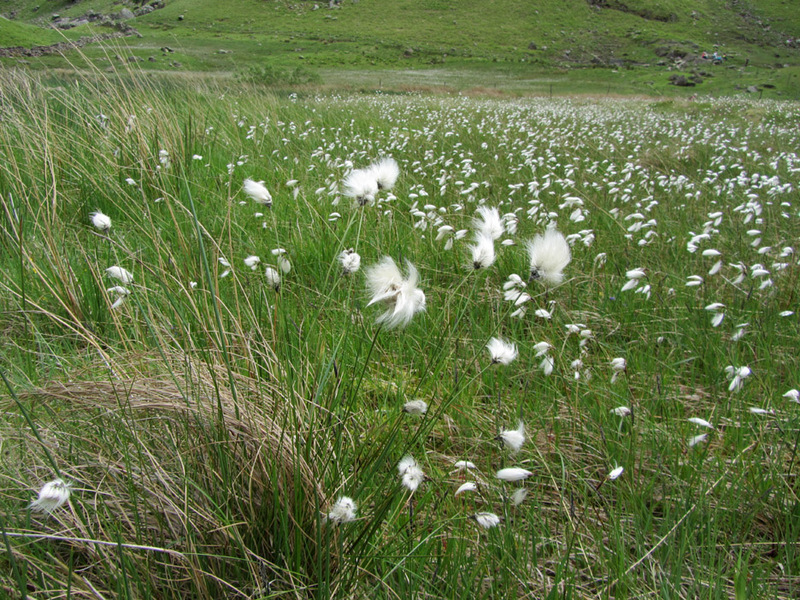 A slight diversion onto the grass meant we passed close to this large display of Cotton Grass just reaching maturity. 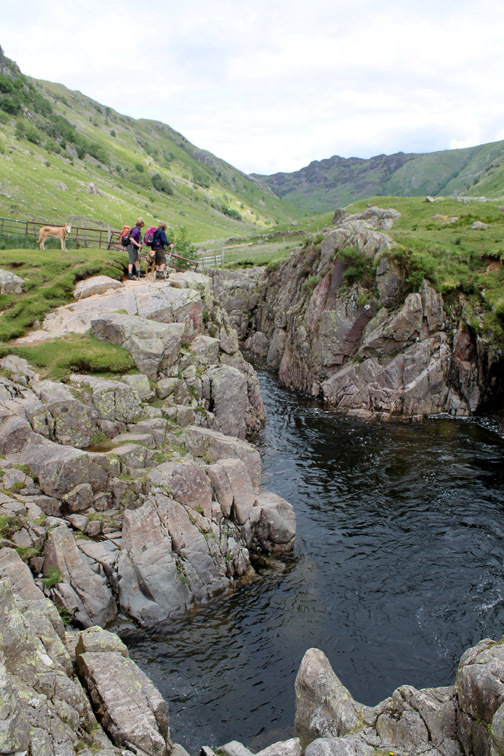 To vary the route slightly we crossed the bridge near the foot of the valley . 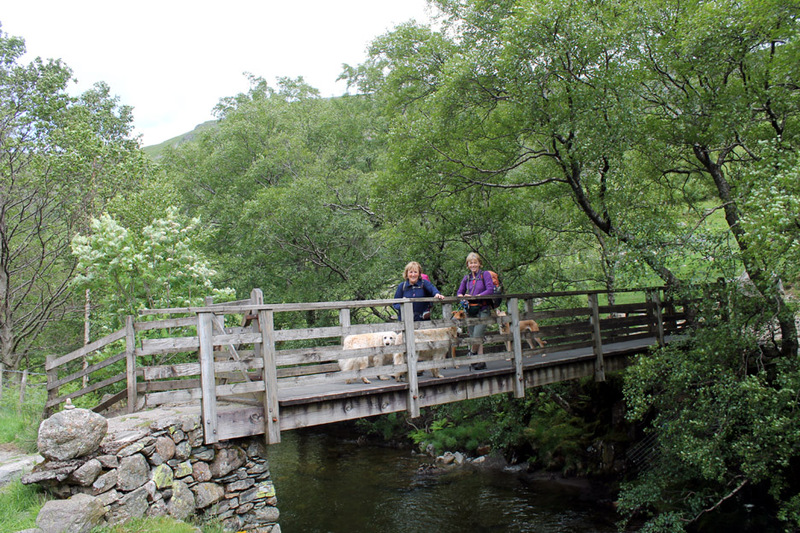 . .
heading for Greenup Gill and the memorial footbridge at Smithymire Island. 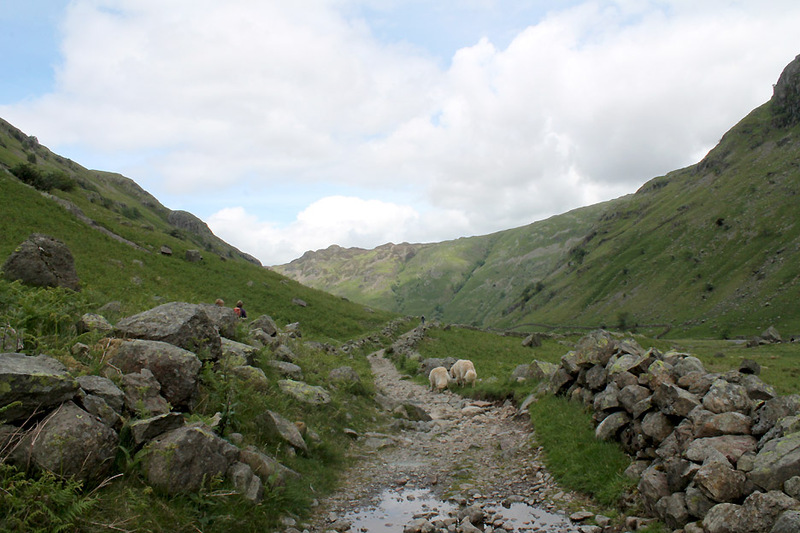 A last look back at Bowfell and the diminutive Rossett Pike ridge leading up to it. 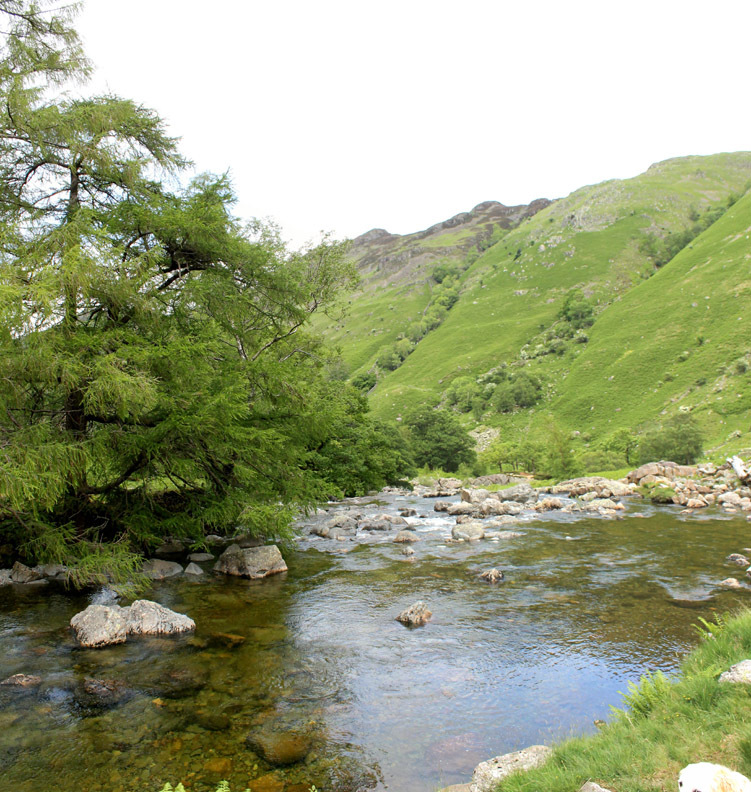 A rich green larch hangs over the river at the head of the next set of cascades. 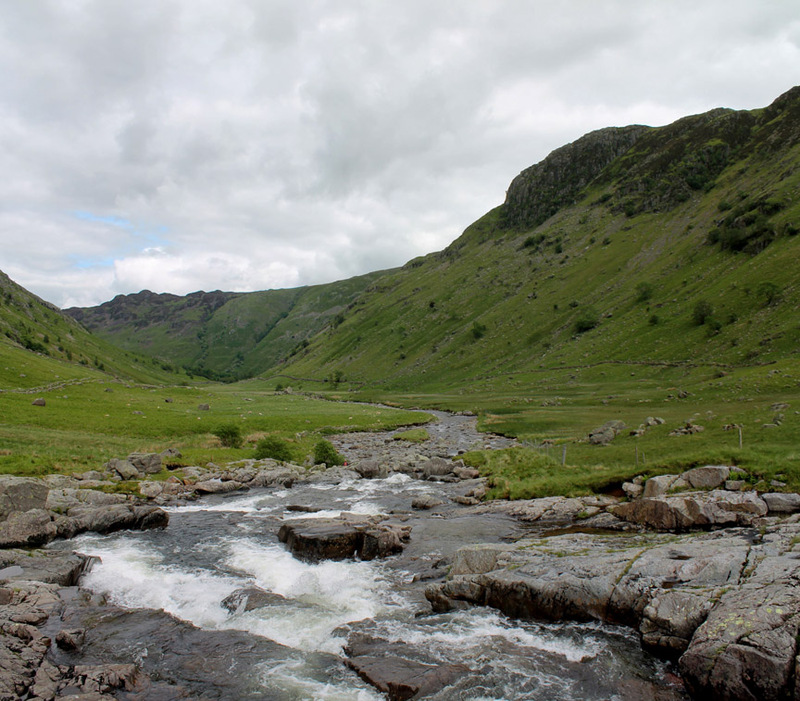 The Langstrath Beck meets the Greenup Gill and together they head on down under the combined name of Stonethwaite Beck. 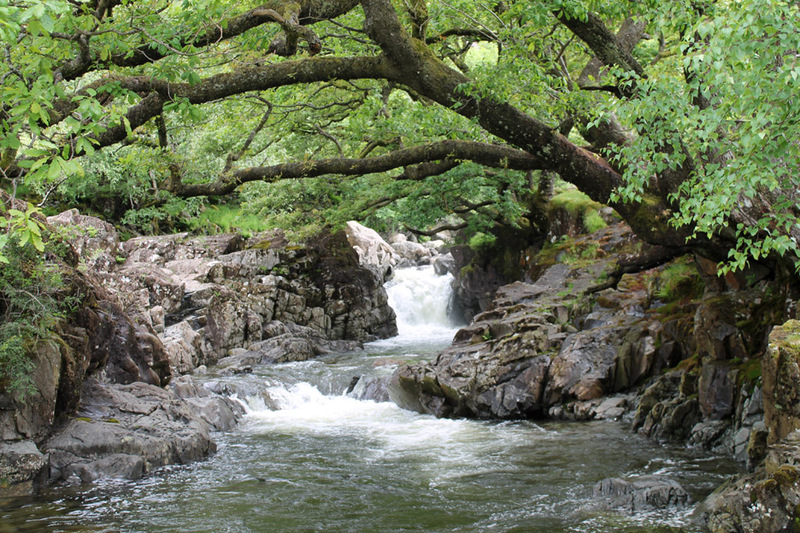 The young lads from the family opposite have just enjoyed a cool swim in the deep pool hidden in the ravine. on the opposite bank from the one we used on the outward part of our walk. 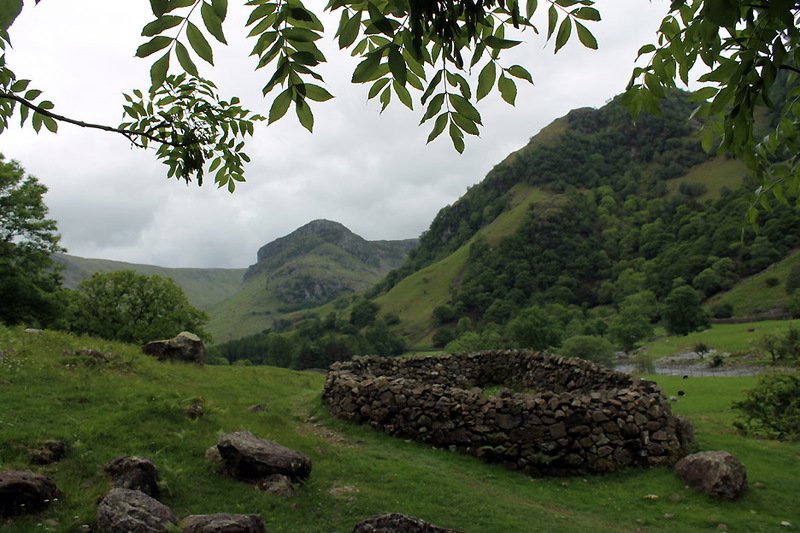 The sheepfold and Eagle Crag . . . always a classic photo opportunity . . . better with a more colourful sky. 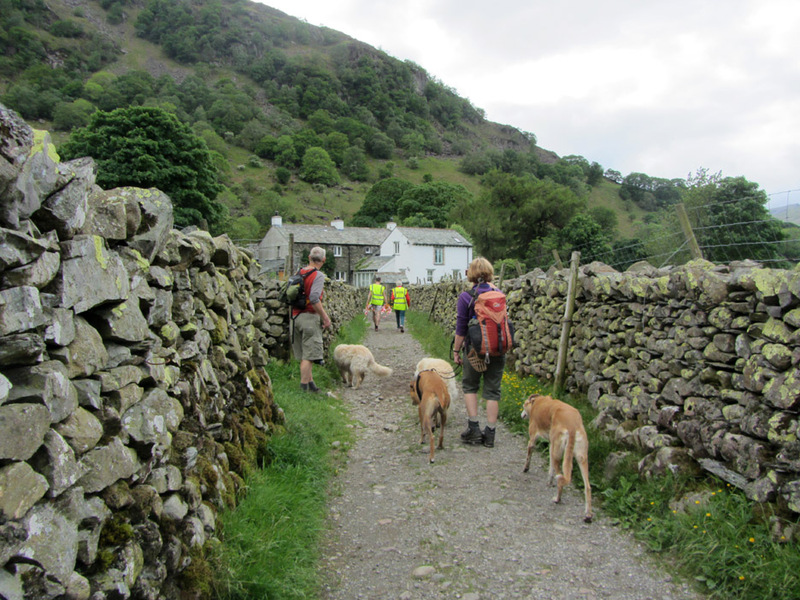 and pass us as we approach the houses of Stonethwaite once more. Time for a gentle re-hydration . . . well suited to this gentle walk out and back, half the length of the "long valley"
Many thanks to the Peathouse Tearooms . . . one we have been meaning to visit for some time but never found open before. Our walks normally end much later than this ! As is often the way . 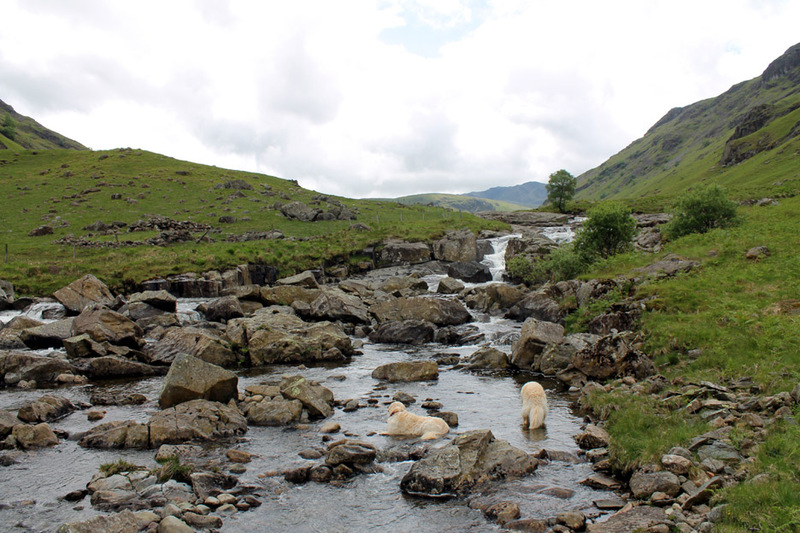 . . the weather improved as the afternoon progressed and as we left the central fells. 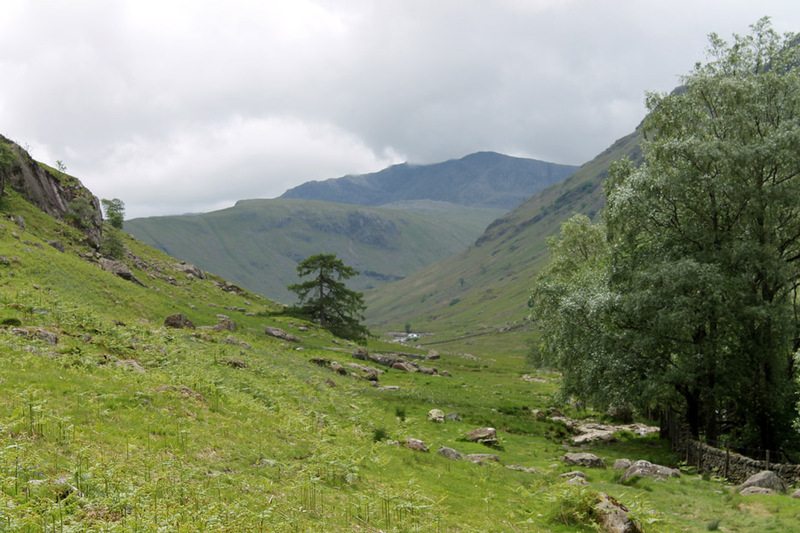 We stopped at Honister for a little light retail therapy and drove home past the Buttermere Pines. 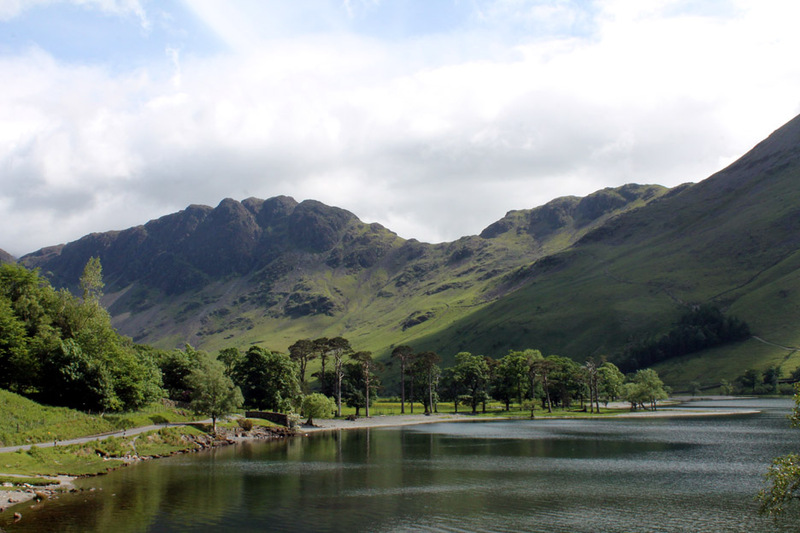 Very pleasant afternoon light at the head of Buttermere at the end of the afternoon. 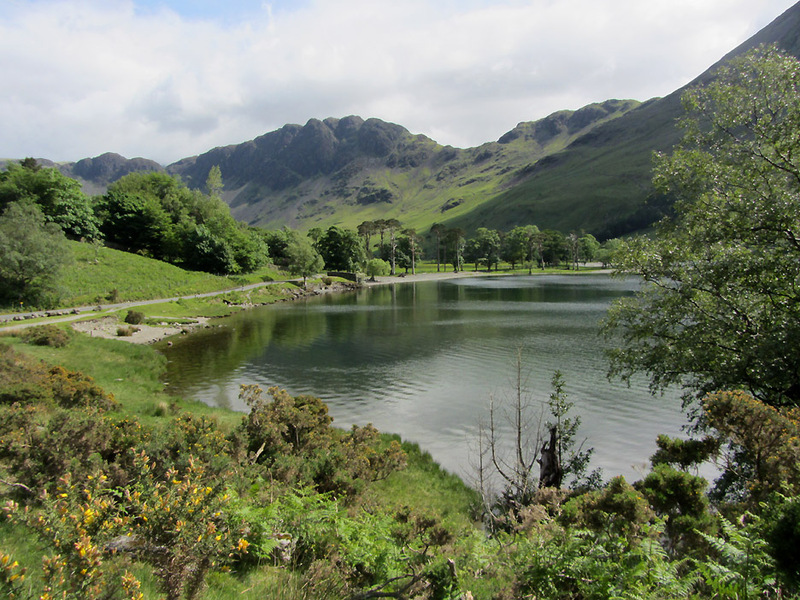 This site best viewed with . . .a little Honister Slateware in the bag.